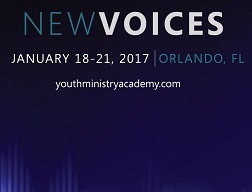 The Youth Ministry Academy returns for a third time to Orlando!!! New Voices characterizes the entire event. All of our featured speakers are in their 20s and 30s, relatively new to youth ministry (says this 53 year-old). They are practitioners working in local churches as well as youth ministry theologians working in the university setting. The event will have some similar elements found in all youth ministry conferences. There will be workshops. There will be fun. There will be worship. Connection with other youth ministers will happen. What is distinctive? Worship will be led by clergy, centering around worship and not a keynote’s speech (although we have had some great ones in the past). The featured speakers will be giving TED style talks. This means they will have a polished 15 minute presentation on an interesting focus of youth ministry, hopefully raising awareness or perspectives not seen by other youth ministers in the past. There will be three of these on each of the first two days. More in depth conversation will follow as they will lead an expanded workshop on their topic. On Friday night and Saturday, youth ministry volunteers will be invited to be part of the training event. This will allow entire teams of people to receive great information and worship as the event concludes. We know it will be a great event. We are also hoping people from snowy regions will want to travel to Florida on January 18-21.